The Sony Boombox offers a total solution for anyone’s basic home audio needs. This compact, portable yet surprisingly potent system offers multi-format playback to a quality rarely seen as such an agreeable price point. As we shall see in this Sony Boombox review, this is a very reliable and easy to use system that’s also ideal for outdoor use too. So, without further ado, let’s put the Boombox through its paces. Excellent Quality Multiple Format Playback. Despite its petite stature this system delivers stereo quality sounds across a universal range of formats. Featuring a classic front facing cassette tape deck, a CD/CD-RW player and docking stations for digital music collections, it’s capable of playing back pretty much anything but vinyl! This is particularly handy for anyone who has a large collection on audio tape, MP3 CD’s and CD-R/RW’s. The cassette deck is a nice feature that you don’t see everywhere nowadays, and also offers a useful record feature too. Just like the good old days this allows users to record music played back from other formats to cassette, handy for anyone who likes to make their own mix-tapes. This is also the case for recording radio too. CD and MP3 digital formats can be set to shuffle or programmed to play back exactly as required (you will need to supply your own docking cable though suitable for your device). Don’t forget that the Boombox also doubles up as a FM/AM digital radio tuner. It comes pre-programmed with 30 stations and can store anyone’s local favorites, and also includes a sleep timer feature. There is an antenna built into the unit which can be extended and directed for superior reception. Featuring Sony MEGA BASS Technology. As many be expected from a stereo titled the Boombox, this player includes specialized circuity that brings low bass tempo truly to life. The bass enhancement is available literally at the press of a button, and as with all playback features can be programmed exactly to suit whatever your listening to at any given moment. Alongside the bass-reflex performance the sound quality is one of the best going for general listening, delivering a classic true stereo playback. The system offers a large sized LED screen that allows users easily enjoy their music just as they like. Playback options are easily navigated with a very accessible and easy to follow menu selection button. There’s no fiddly menus to bother about – this is a system very much aimed towards straightforward ease of use, and delivering a top-quality audio performance. Handy Dimensions Alongside Excellent Design Quality. As one should expect from Sony, the Boombox is all about delivering maximum returns alongside total utility. Weighing only 2.5 pounds and measuring 13.7 x 6.1 x 9 inches, this stereo would be perfect in any room of the house. It also has a 19-hour battery life making it a very handy option for outdoor portable use. The Boombox comes complete with an A/C charger as standard and features a headphone jack (3.5mm) on the left-hand side of the unit. A comprehensive modern day take on the classic boombox model that really is capable of playing almost anything going. Anything from old school tape cassettes through to digital audio files, this device can handle it. The MEGA BASS feature isn’t a gimmicky soundbite – it really does enhance the overall feedback. Given its dimensions the sound quality is very impressive indeed. This is a multipurpose product that can be used pretty much anywhere and in any context. Given its small size it would be ideal as a bedroom or kitchen music player/radio, but there’s no difficulty imagining this being just as handy outdoors or even on the road thanks to it being so lightweight. The battery life is an impressive feature. Customer reviews have suggested that the vast majority of people who have purchased the Sony Boombox are very satisfied. Points worth noting are that it performs especially well at low volumes thanks to the bass control, making it good for quiet personal use as well as on louder settings. Most also report that the cassette playback is reminiscent of a top of the range player. The cassette player does not feature automatic reverse. This is a surprising oversight seeing as so many people’s tapes are likely going to be dual recordings. While playback is excellent and the unit looks smart, it is plastic and therefore must be considered to be slightly on the fragile side. Given its price point this is hardly surprising – and not even necessarily much of a negative – but do be aware that it is very light. 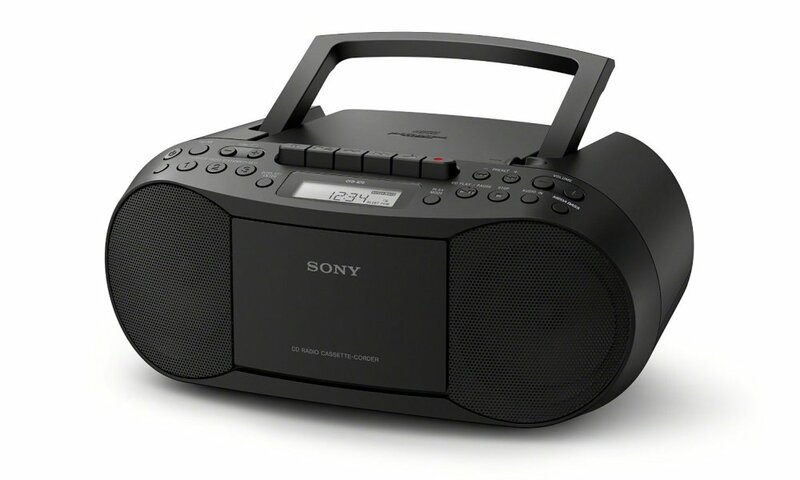 It’s easy to see why the Sony Boombox has proven to be such a popular product. It offers a very good quality performance at a standard that is above its cost, and as a go-to daily music player it will easily satisfy all but the most demanding users. It’s reassuring to have the Sony name on this product thanks to their reputation for delivering usually higher end consumer electronics, but in this instance, they’ve served up a really impressive value gem. The Boombox therefore is highly recommended indeed. Wow, what a great boombox. I like one that can play so many mediums, including old ones like casette tapes.Sony is a great brand and I’ve had nothing but positive experiences using them, so I imagine your description of the great sound quality is true. 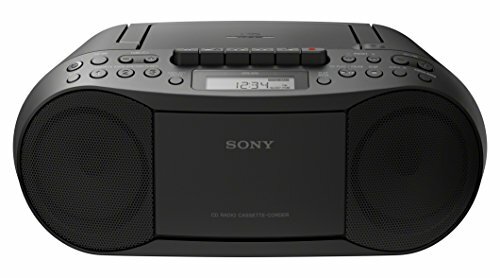 This one doesn’t have Bluetooth but if you like the Sony, then you might wanna check the Sony Portable Megabass Stereo Boombox wich has Bluetooth.